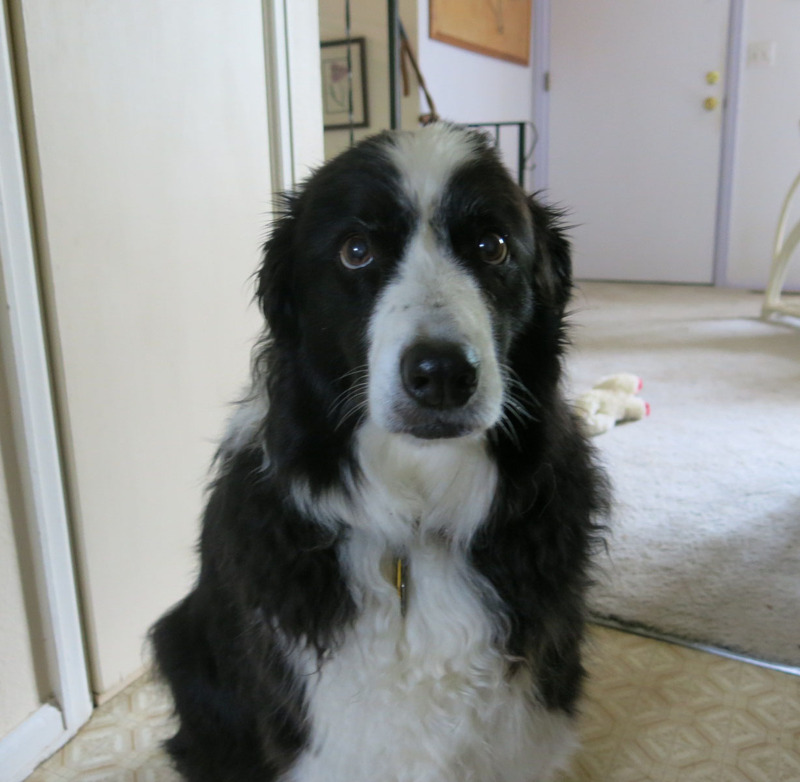 Greetings, everyone; it is I, Chess the purebred border collie, once again. You may remember me from such delightful posts as “More Far Niente Stuff” and “The Dog Days”, among many others. Here I am in a characteristic pose, looking as congenial as can be, don’t you think? It was indeed a wonderful day today, perfect weather for border collies. Cool, cloudy, damp, and drizzly, with no scary thunder (yet). I got soaking wet on our walk, going through the tall grasses. All the little plants that were put in the ground yesterday (was it yesterday?) were rained on, which hardly ever happens here. Usually what happens is that plants are put in the ground, watered in, and then forgotten about, until the guy I live with sees them in a totally crispy, dead state, and then he says things that make me blush. Almost nothing happened today, though the guy I live with did some pointless puttering in the garden. It wasn’t entirely pointless, I guess, because he repotted some cactus. Pause for effect, huh. Not entirely pointless. Get it? There was a snake in the mockorange, Philadelphus microphyllus. I think they hang in the shrubs and trees to get warm. It’s a garter snake, so not to worry. 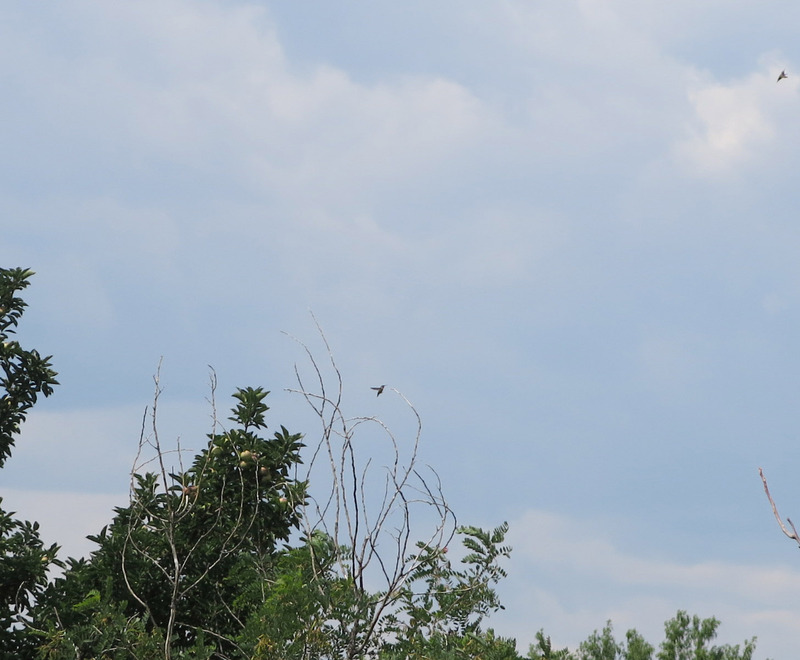 And there was a hummingbird fight. 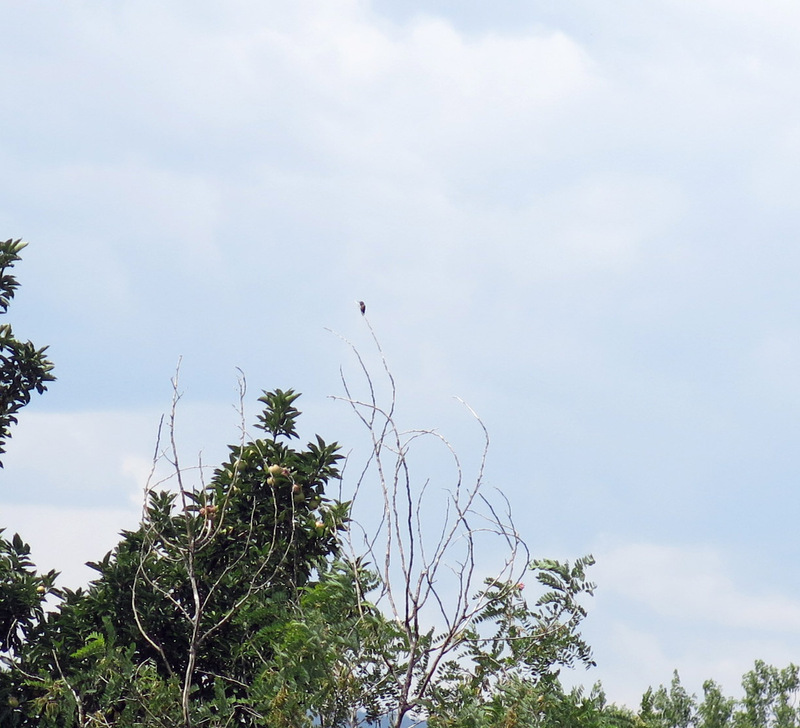 Here’s the hummingbird, just sitting there doing nothing, on the top of the half-dead coffee tree. Then all of a sudden, here comes another, I guess trying to sit where the one already was. Then they flew around for a minute or two. And then nobody was sitting at the top of the tree. Anyway, no sooner did the mystery grass get planted, than someone fairly little discovered it, with intentions that the guy I live with described as “nefarious”. 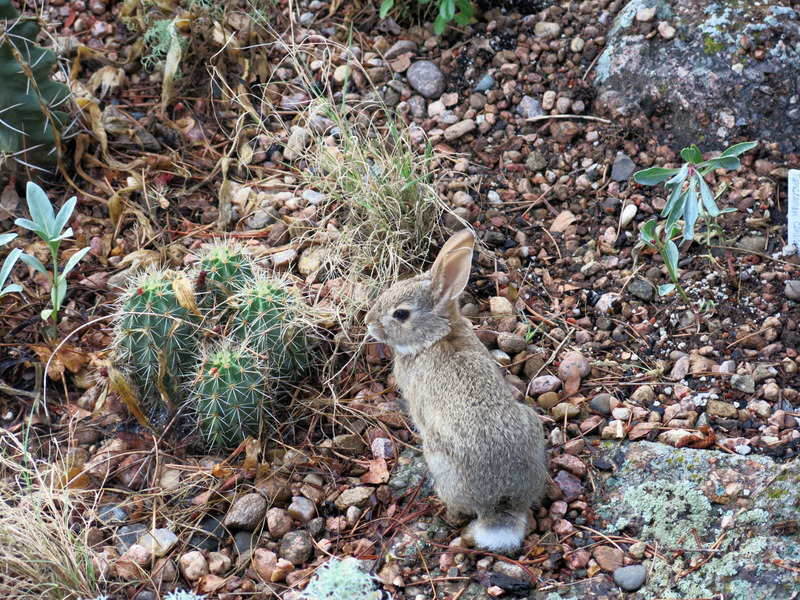 Cactus, Penstemon centranthifolius, and the mystery grass, which was about to be chomped, in this picture. The only other thing going on is an obsession with oriole feeding. The guy I live with bought some oranges to go with the grape jelly and so there’s been a constant stream of orioles to the feeders. 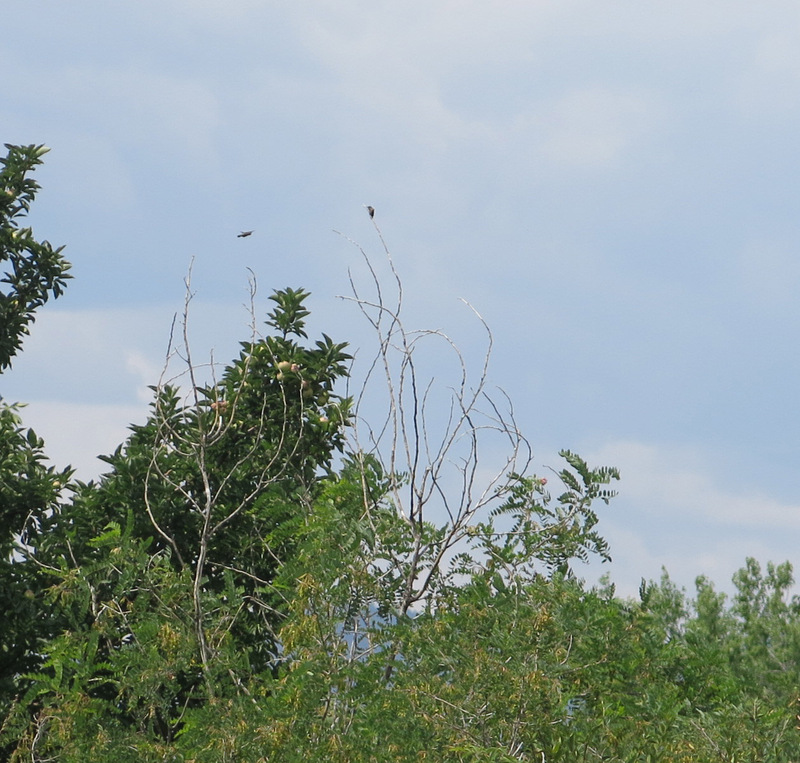 There are orioles in this picture, believe it or not. One is inching down the stem, or whatever, of the feeder on the right. You can see the orange halves skewered on the feeder, too. The orioles go through an orange a day. I mean to say that they eat an orange a day. Orioles can’t go through oranges. The guy I live with says he’s going to turn into a sad, lonely old man who feeds the birds, and shuffles around the garden waving a stick at creatures who try to eat his plants. He’s not very good at playing pathetic. This is what pathetic really looks like. So that was our day. Not much in flower in this dry garden, though maybe the rain will help with that, later. Until we meet again, I guess. 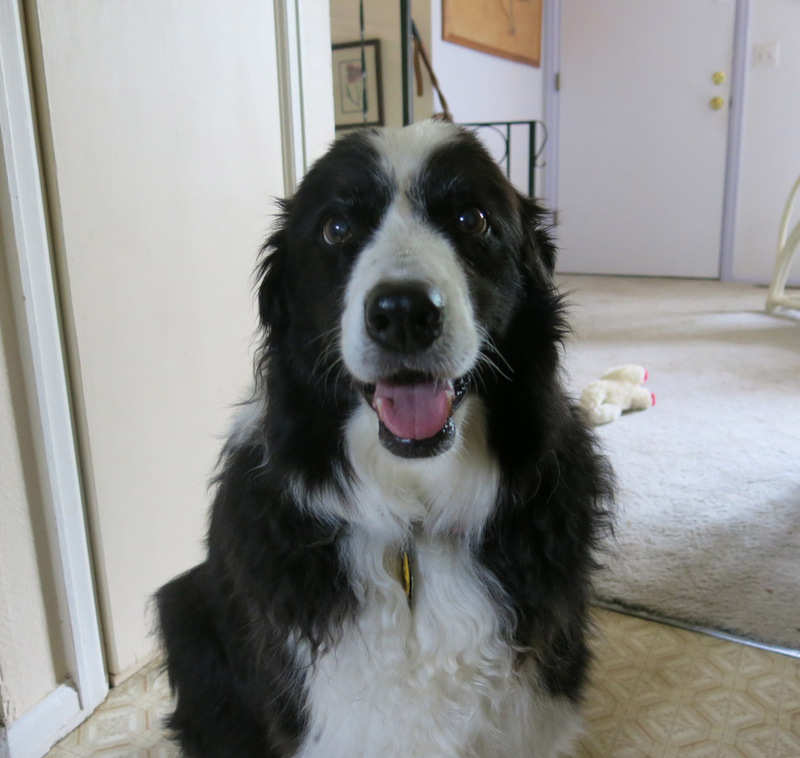 This entry was posted in Uncategorized and tagged border collies, Bullock's oriole. Bookmark the permalink. They’re just garter snakes…. I suppose I shouldn’t go around the garden on a warm morning and take pictures of them lolling in the shrubs and trees. 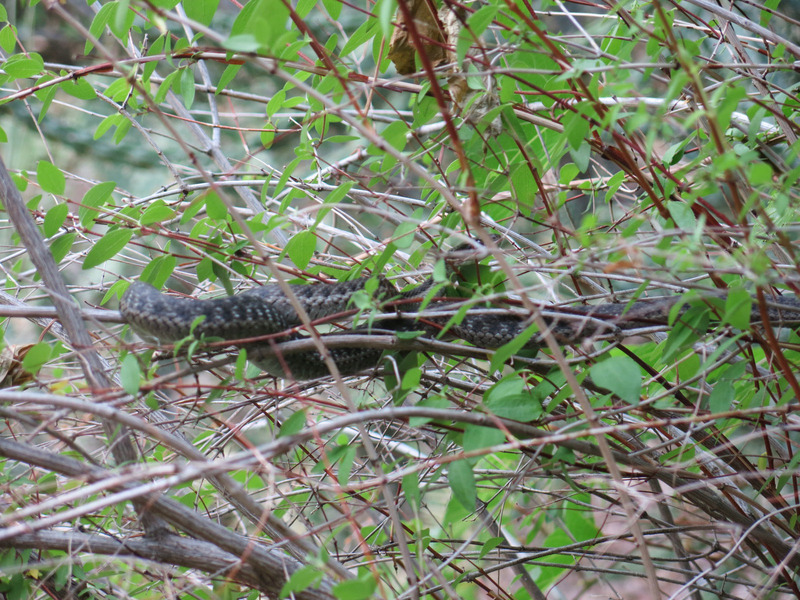 I missed getting a good picture of the four-foot long bullsnake that visited the front yard a couple years ago. There is no “just.” Sure it won’t kill me but It could fall on me and slither into my hair. Nightmares. Bwa ha ha, then, I guess. Saw a green racer in the garden today. Very large snake. There’s a reason why they call them racers, too. Zipped out of sight in no time. There certainly are a lot of western garter snakes about. I have one that lives in my tomatoes and huffily slides away when I (shhh) water them. By the afternoon he’s back. Helps keep the garden vole population below 1 million or so, I guess. They help with mice, too. A decent garter snake population will take care of an infestation of mice in no time. This from experience…. I’m with Loree — a snake in the shrub is waaaaay too much nature for me. Fighting hummingbirds: isn’t that why the Aztecs thought hummingbirds were the reincarnated souls of warriors? They are supposed to be vicious little bastards but I’ve never seen them in action and to have caught it on camera — wow. I had to laugh at Chess’s pathetic border collie look. Talk about hang dog. Hilarious. I’m a terrible person. BTW, oh yes I know from “embiggen”. And it’s handy corollary, “ensmallen”. It might interest you that when I was reading historical documents in Scotland (looking for ancestors) I found a stone mason/alleged relative from 1502 who was mentioned in the treasury’s account books as having been paid for the “bigging of Halyrudhouse” (the expansion of the old pile in Edinburgh). And Simpson is a common lowland Scotts name. Wheels within wheels, as the Bertram says. Which reminds me of fiction that is worth an hour or two of your life. Snakes in the laundry room, in the basement, too. Not very often, but occasionally. I like snakes and they do some useful work around here, unlike someone else I know. I draw the line at walking into spider webs, which I did two nights in a row, at Tinkle Time. Spent about half an hour making sure the builder hadn’t fallen on me, or in my pockets. 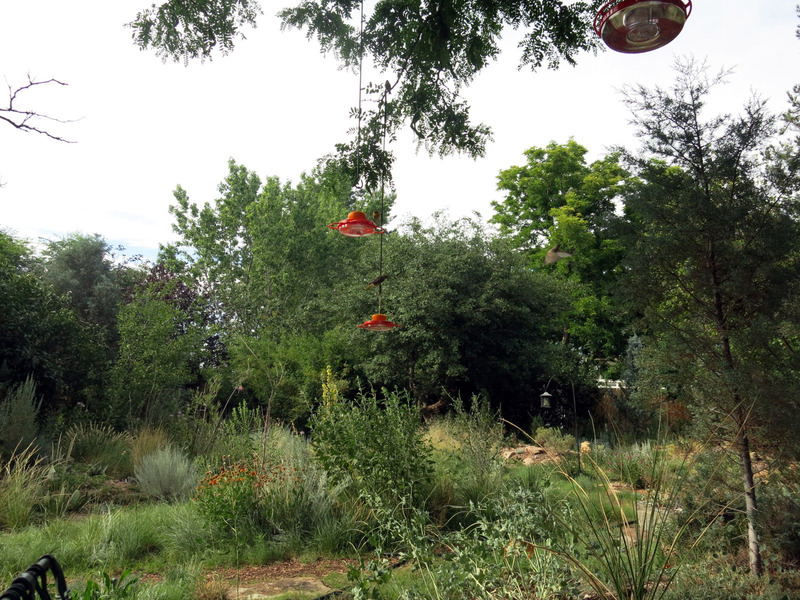 Hummingbirds can be pretty aggressive, especially the rufous, but I haven’t seen any of the fight over the swing I put up. A hummingbird swing, I mean. If things had take the right course, I supposedly would have been heir to a castle near Stanraer. Close enough to Logan that I’d be growing tree ferns and subtropicals in my garden. My castle garden. With ma tweeds an a herd a border collies an a wee dram.